My very favorite times to get creative with my kids school lunches is the week of a holiday! It’s so much fun to do something creative for their lunchbox when there is something to celebrate! It doesn’t matter if the reason is a big holiday, a random themed day of the year, or even just a special day in our family. Here are 5 fun Celebration Lunch Ideas you can make for your kids! This post is sponsored by Go-Gurt. All opinions are my own. Celebrations take on so many different shapes and sizes, here are a few fun themed lunchboxes to try for just a few fun dates and seasons to celebrate. We can all finish the rhyme, right.. “In 1492, Columbus… (sailed the ocean blue)”. Making a fun lunchbox for Columbus Day will make your child the envy of the lunchroom! 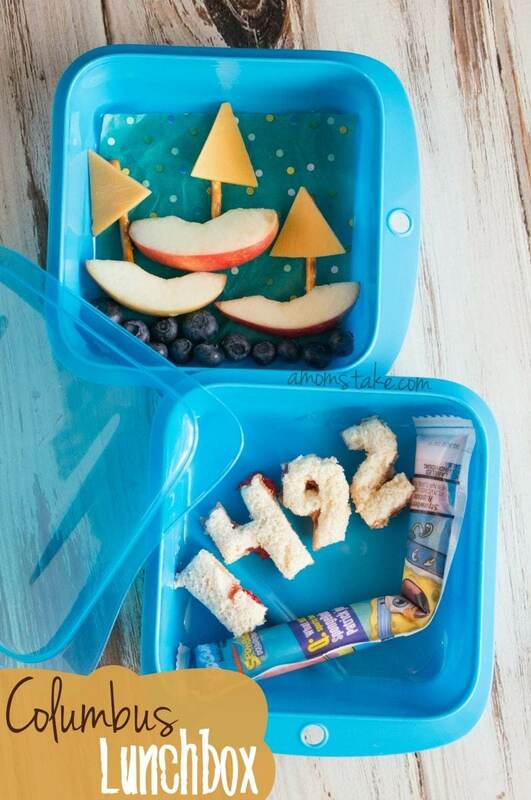 Cut out the year 1492 using cookie cutters or a knife from a basic PB&J sandwich to add learning fun to lunch. Next, make the three iconic boats using a sliced apple, pretzel, and a slice of cheese cut in a triangle to resemble a sail. Line the bottom of the plate with blueberries and a blue Go-Gurt to resemble the ocean blue! There are many times you can celebrate with a patriotic themed lunchbox throughout the year, but the most iconic date is the 4th of July! Even if your child isn’t in school, this fun lunchbox will be a hit! Plus, it is really easy to make. Start by de-stemming 3 strawberries and cut them in half from stem to tip. Then, cut the halves into thin slices. Next, cut a string cheese in half lengthwise and then cut one half in half again width wise this time. Lay your cut strawberries two at a time into a row alternating with the string cheese. Fill in the top left corner with rows of blueberries and you’ll have an American flag that really stands out! Stack a few pretzels and punch out a slice of cheese using a small star cookie cutter and lay them on top of the pretzel stack. Finally roll a slice of cheese with two pieces of ham lunchmeat to create pinwheels. Add in a Go-Gurt to round-out the meal and you’re done! A birthday is the best type of celebration! Go all out making their birthday lunchbox fun by making a mini birthday cake from a simple sandwich. Just cut the sandwich into 3 rectangles descending in size. Top the “cake” with pretzels and triangle cut blocks of cheese to resemble birthday candles. Don’t forget to decorate the cake! 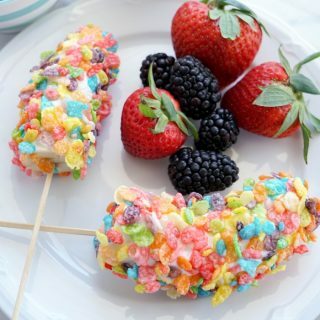 Fruity Cheerios look great to add color and a bit of sweet to the lunchbox. Add a side fruit salad and carrot sticks. Don’t forget a Go-Gurt! These fun lunchbox ideas for Halloween can be used throughout the whole month of October! I started with a Go-Gurt Mummy! Just wrap a folded paper towel around your Go-Gurt to create a mummy and draw on a face right on the package with a sharpie. Use a piece of tape on the back to secure the paper towel in place, if needed. A single hard boiled egg turned into a deviled egg creates monster eyes with a single raisin on top of each eye. Turn the eyes into a monster with thin slices of cucumber for a mouth. Add a side pasta and cheese dish by using up leftover noodles and melting a bit of cheese. Pick the craziest noodles you can find and top them with a dash of parmesan cheese and pepper. A mandarin orange is a sweet way to add in a mini “pumpkin” to the lunchbox! Play up the Winter theme the middle weeks of December before school lets out. Add a Snowman by cutting three varying sizes of circles from a sandwich. Complete his look with a pretzel hat and arms and raisins for his buttons. 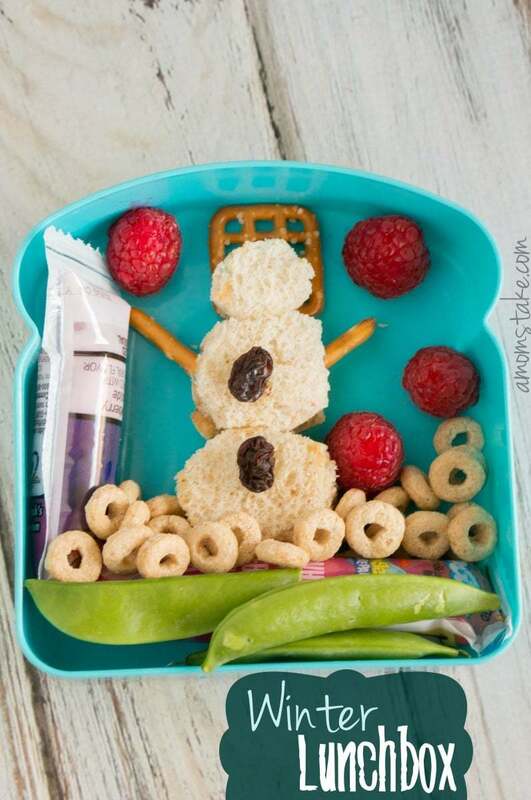 Cheerios make a great pile of snowballs to turn the lunchbox into a scene and add raspberries and pea pods for some red and green Christmas spirit! What are your celebration lunch ideas? This is so awesome! What, cool, creative ideas, and we love go-gurts, especially frozen! 🙂 Thanks so much for sharing on Turn it up Tuesday! I love your ideas. Since I have a picky little guy I have been packing him a luch each morning. I am going to start making bento box lunches to thanks for the ideas. Super cute, these would be fun for my preschooler to home to for her lunch. These are cute ideas! I get fun with lunch but don’t get all artsy – my kids aren’t careful with their lunch so it would be a mess by the time they ate. These are darling! I can imagine how excited kids would be upon seeing these. Love. 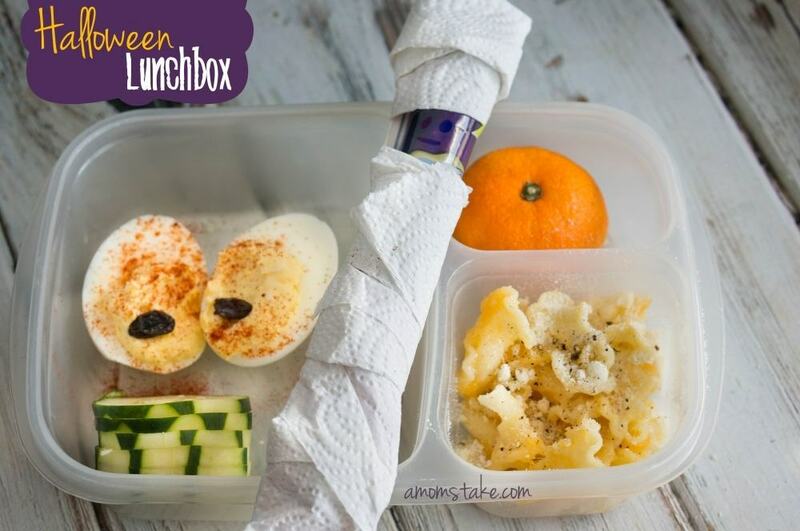 Super cute lunchbox ideas! Love those halloween ones! Those are such fun ideas. I love love love the Halloween one. May do that more often…lol. 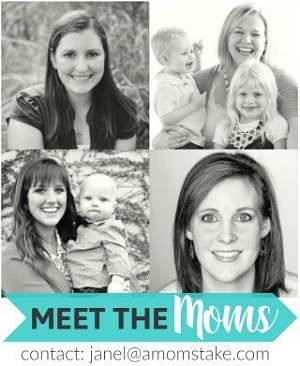 OMGosh these are super cute ideas! My littlest one doesn’t eat lunch in school but I could make here these cute things at home. What cute ideas! 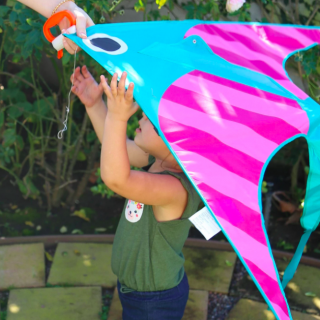 Love the boat idea, my son would too! Oh my goodness, I am in awe of these… each one is literally better than the one before… I love them all! The boats, apples and blueberries are so cute!! I love these ideas so much! No joke these cute lunches just get me everytime! I LOVE them – especially columbus day – so creative. Super cute ideas. Love all of this stuff. OMG, these are too cute! I love the winter themed one. These are all so cute! I love bento boxes. I can’t think of anything to make a lunch more fun. The American flag is adorable! 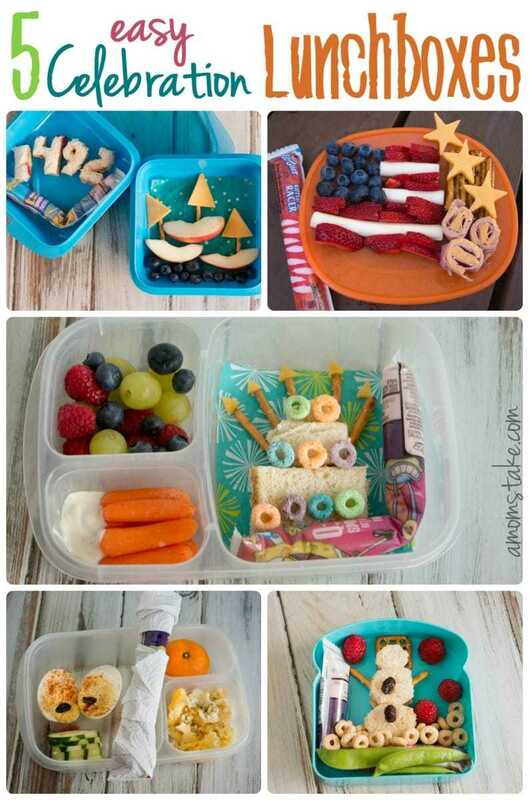 I wish I would have thought about cute ideas like this when I used to pack my daughter’s lunch. What adorable and creative ideas! I especially love the birthday one. I love the Fourth of July themed lunchbox. I bet you could reuse it for President’s Day too! I love that Halloween lunch box!!! I think I will make something silly like this for hubby’s lunch! I love all these ideas but the birthday one is my favorite. 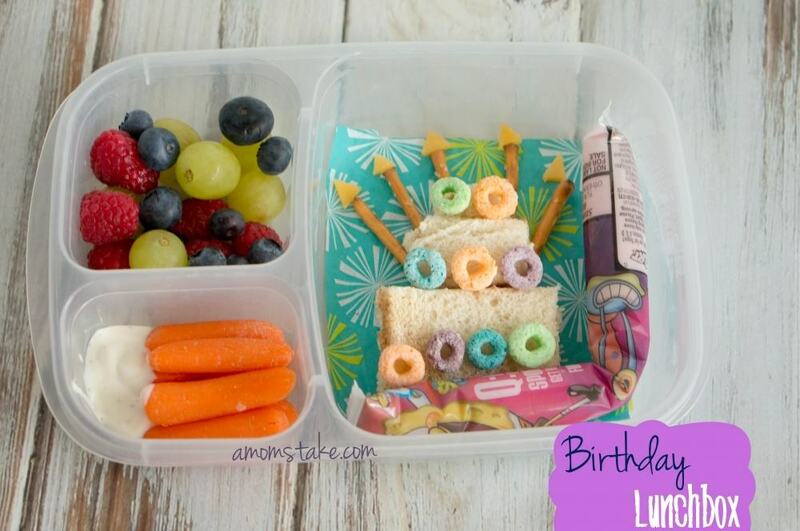 I wish i would have thought of doing lunches like this when my kids were younger. 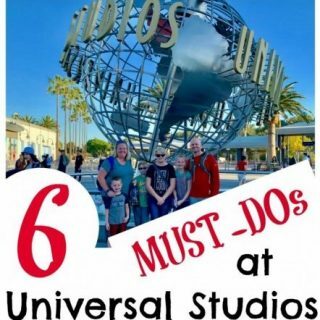 Great post thanks for the great tips. These are adorable. I love the birthday one the best. These are cute ideas, love it. Great way to celebrate Columbus day. These are such cute ideas! I’m going to make those little sailboats for my son. How creative! I love the Red White Blue, and the Egg eyes! All of these are wonderful and fun lunches! I really like the birthday box- that is so creative! I often have fun playing with food to make it more fun for the kiddos too; but haven’t gotten creative with meals leaving the home! Those are so stinking cute! I especially love the 4th of July Lunchbox! The birthday box with the Froot Lopps is ADORABLE! 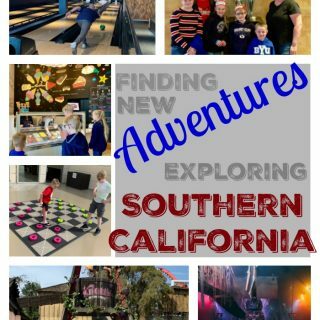 I love it and I know my kids would appreciate it as well. OMG, those are all so cute. I love that snowman for winter. I am definitley doing that for my kids this year! What cute ideas for lunch! I especially like the Go-Gurt Mummy! This is something I definitely couldn’t pull off everyday but I love all of the ideas! These are so cute! I love the Columbus Day & Winter Lunchbox ones. great presentation. The first two are too cute. I think my favorite lunch is the one with the snowman sandwich!